Talking to My Mum is an activity pack for five-eight-year-olds whose families have experienced domestic abuse to help and encourage them to open up to their mothers about their distressing experiences. Talking to My Mum is an activity pack for five-eight-year-olds whose families have experienced domestic abuse to help and encourage them to open up to their mothers about their distressing experiences. 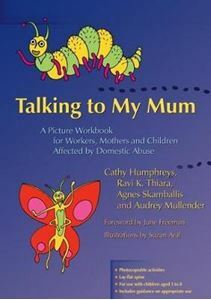 Based on the authors' work with families who have experienced domestic abuse, the book is full of illustrated worksheets featuring animal characters who encourage the young reader to explore a range of memories, such as changes in the family's living arrangements or happy memories with siblings or favourite toys that each prompt a particular emotion. These activities are accompanied by guidance on how to use them appropriately. Talking to My Mum is designed for children and their mothers to complete together, and will assist both child and mother with improving communication about the past, present and future. This activity pack will be an essential tool for families with children who have lived through domestic abuse, as well as social workers and other professionals working with them.